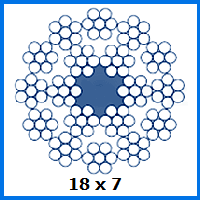 Intricately constructed from 18 bundles of 7 stainless steel strands, this 7mm 18×7 Stainless Steel wire rope is amongst the sturdiest configurations we produce from the perspective of resisting wear and tear. Surface abrasions will be less likely to occur and it is also not susceptible to corrosion. This 18×7 stainless steel rope is the second narrowest example we offer, coming in with a diameter of just 7mm. It still manages to boast a 2,572kg load limit, along with a hefty 25.2kN breaking load rating. While this product may not be quite as strong as an equivalent 1×19 construction rope, its sleeker surface reduces the amount of fatigue that occurs during use. As a result it may be better suited to certain applications, especially within marine environments where its anti-rust properties come into play. Since we supply fittings as well as stainless steel wire rope, it is simple for us to make something completely customised for you. This can include bespoke assemblies, slings and whatever other structure you might want. Rope Services Direct can even produce and provide other types of rope, including man-made and natural fibre rope. Cast your eyes over our range then get in touch to request your made to measure creation. Dial 01384 78004 to have a phone conversation with our specialists about your wire rope order. Write us an email if you are eager to get a quote or have a question answered but cannot spare the time for a call. 7mm 18x7 Stainless Steel Wire Rope Overall rating: 5 out of 5 based on 6 reviews.